Director Andy Muschietti's upcoming sequel to his hit adaptation of Stephen King's IT is heading our way this September. Written by Gary Dauberman, IT: Chapter 2 is easily one of the most anticipated horror movies of all-time. This time around, the kid cast had been replaced with adults such as Bill Hader, James McAvoy, and Jessica Chastain. 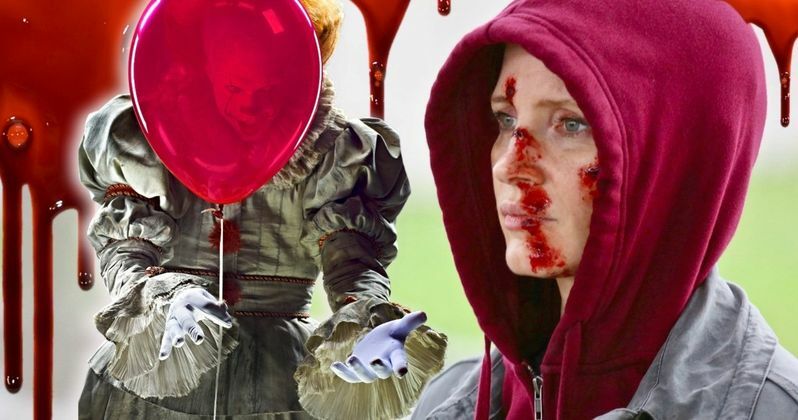 And Chastain was recently a guest on The Tonight Show with Jimmy Fallon and dropped a fun tease for just what kind of mayhem we can expect from Pennywise the Dancing Clown when the second chapter creeps and crawls into theaters this September. Turns out, this new movie features a scene which Jessica Chastain says is the most blood that's ever been in a single scene of a horror movie. Watch out, Stanley Kubrick's The Shining and the blood rain from Fede Álvarez's Evil Dead remake. Jessica Chastain told Jimmy Fallon. "Okay, I'm going to say something, and I think I'm going to be in trouble, but I'm going to do it. It might be a spoiler. But in the movie, there's a scene that someone said on set that it's the most blood that's ever been in a horror film in a scene. And I'll tell you, the next day I was like pulling blood out of my eyeballs." Pulling blood out of her eyeballs? Nice! Sounds like fun to me. Now I've read Stephen King's source novel many times (it's my favorite book) and I'm kind of at a loss for guessing just what scene this could be. Sounds to me like something the filmmakers added to the mix. But then again, how fitting would it be that the death of Pennywise and the entity known as IT met its end with the bloodiest sequence ever? That sounds like a fitting way to go to me. I guess we'll find out this September! Until then, here's the official synopsis for IT: Chapter Two via Warner Bros. and New Line. Twenty-seven years after the horrific events of the summer of 1989, It (Bill Skarsgård) returns. The Losers' Club fulfills their promises and returns to Derry to put an end to the shape-shifting beast once and for all. Along with the above-mentioned adult cast of Chastain, McAvoy, and Hader, IT: Chapter Two will also feature Jay Ryan as adult Ben Hanscom, Isaiah Mustafa as adult Mike Hanlon, James Ransone as adult Eddie Kaspbrak, and Andy Bean as adult Stanley Uris. From the first film, the kid-cast will also return with Jaeden Lieberher as Bill Denbrough, Sophia Lillis as Beverly Marsh, Jeremy Ray Taylor as Ben Hanscom, Chosen Jacobs as Mike Hanlon, Jack Dylan Grazer as Eddie Kaspbrak, and Wyatt Oleff as Stanley Uris. On top of all the returning cast, the new film will also add Teach Grant as adult Henry Bowers, Jess Weixler as Bill's successful actress and wife Audra Phillips, Will Beinbrink as Beverly's abusive husband Tom Rogan, Xavier Dolan as Adrian Mellon, Taylor Frey as Don Hagarty, and let's not forget Jackson Robert Scott as Georgie Denbrough, and Bill Skarsgård as It / Pennywise the Dancing Clown. IT: Chapter Two creeps and crawls into theaters on September 6, 2019. This story debuted over on The Tonight Show With Jimmy Fallon.